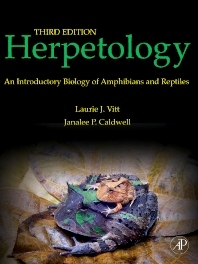 This third edition, now fully revised and updated by two of Dr. Zug's colleagues, provides herpetology students and amateur reptile and amphibian keepers with the latest taxonomy and species developments from around the world. Herpetology is a rapidly evolving field, which has contributed to new discoveries in many conceptual areas of biology. The authors build on this progress by updating all chapters with new literature, graphics, and discussions—many of which have changed our thinking. With a new emphasis placed on conservation issues, Herpetology continues to broaden the global coverage from earlier editions, recognizing the burgeoning reptile and amphibian research programs and the plight of many species in all countries and all biomes. New information on the remarkable advances in behavioral, physiological, and phylo-geographical data provide students with the current research they need to advance their education and better prepare their future in herpetology. Dr. Vitt is a reptile ecologist who received his Ph.D. from Arizona Sate University in 1976. He was a Professor at UCLA for 8 years and Professor and Curator at the Sam Noble Museum at the University of Oklahoma for 21 years. He currently maintains Emeritus status. He has had extensive field experience in American deserts and New World tropics, especially Brazil. He has published more than 250 research articles and 8 books. Awards include appointment as a George Lynn Cross Research Professor at the University of Oklahoma, membership in the Brazilian Academy of Scientists, Distinguished Alumnus (Western Washington University), Distinguished Herpetologist (Herpetologist League), and two book awards. Dr. Caldwell is an amphibian biologist who received her Ph.D. from the University of Kansas in 1974. She was a Professor of Biology and Curator at the Sam Noble Museum at the University of Oklahoma for 21 years, where she received recognition for outstanding research. She is now Professor Emeritus and Curator Emeritus. Dr. Caldwell conducted field research in tropical forests in Brazil and other South American countries that resulted in publication of numerous scientific articles. She served as President of the Society for the Study of Amphibians and Reptiles and as editor of several scientific journals. She participated is various projects with the goal of encouraging young people, especially girls, to choose careers in science. Very well writen. Very useful during studdying. Great book!